Elizabeth Sloane has been giving babies the gift of sleep for over 20 years. With a gentle, loving and soothing nature, Elizabeth’s methods are credited with breaking cycles of sleeplessness, emotional exhaustion and frustration for babies and their parents. Her program truly is a life changing experience. Mothercraft trained, Elizabeth enjoyed looking after young babies and children but felt there was little support for parents with babies over six months - old who have sleep issues. Following her heart, Elizabeth started offering her unique talent in teaching babies and toddlers to self-settle and found herself inundated with requests for help. Having honed her craft over the past two decades, Elizabeth is deeply committed to each family ensuring their baby reaches their goal. 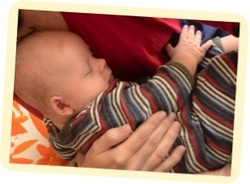 My in home service is a baby sleep consultancy that offers services Australia wide. Your baby deserves to learn the Gift Of sleep in there own home! ▪ Providing assistance with sleep issues. ▪ Developing tailored routines to care for your baby. ▪ Establish healthy sleep and feeding patterns. Importantly, this is all done in the privacy of your own home. Elizabeth lives in Sydney with her family. - Elizabeth is a Mothercraft Nurse with over 20yrs experience. - Elizabeth has helped more than 2000 families with an in home programme over this time. - Provided training and guidance for existing sleep consultants in Sydney. - Elizabeth has raised 3 beautiful children of her own so has first hand experience of the highs and lows of parenting.